Financial forecasting helps companies plan and understand their business better. When you understand your business you can invest the correct amount in the right areas so that your business can continue to grow without running into cash issues. Running your business without a forecast is like going to the airport without a flight booked – it may all work out, but more than likely you will waste your time and money until you get a flight booked or come up with a plan for your business. Forecasting is a completely different skill than accounting. Both involve numbers but they have a different goal. Accounting involves categorizing the past transactions correctly for tax and reporting purposes. Finance or forecasting involves creating a plan by understanding the drivers of a business. It involves understanding how much your sales will change if you run a 10% off promotion or increase marking spend by 10% and determining which option will be better for the business. It explains the “why” behind what is happening in your business. If your sales are decreasing you need to understand what the business reasons and drivers are so that you can invest in the correct areas to fix the problem. Formula for revenue is # of customers * avg sale / customer = revenue. Why do the # of customers change? In this example there are new sales with a deposit revenue and a setup complete revenue 3 months later. The new customers then flow through to recurring customers in the form of SEO and hosting customers 3 months after the sale. It is really important to understand and forecast how a good sales month in Feb will flow through to the biggest change in recurring SEO and hosting customers in May. 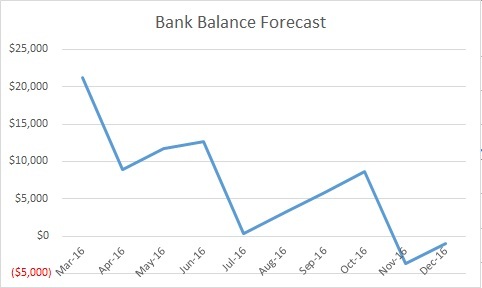 If you were just looking at the total $ or the change month to month then you would greatly miss your forecast for June, which turns out to have the smallest increase in revenue. Once you have a good revenue and cost forecast then you can understand your cash flows. It is important to understand your daily cash and monthly cash flows so that you know how much money to keep in the bank. I start with the daily cash flows because it shows how big monthly expenses like payroll compare to your revenue which may come in spread out throughout the month. Once you understand it you can figure out how much safety cushion you need – or how much money you need to have in your bank account. Once you get close to that number you stop spending until you can build up a safety cushion. 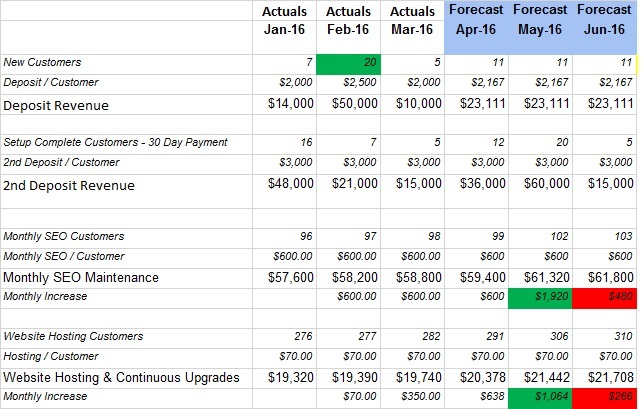 Here is a daily cash flow example – It would be wise for this business to keep $70K in the bank at the beginning of the month to meet their first payroll. You can see the dip for the 2nd payroll around the 16th of the month. 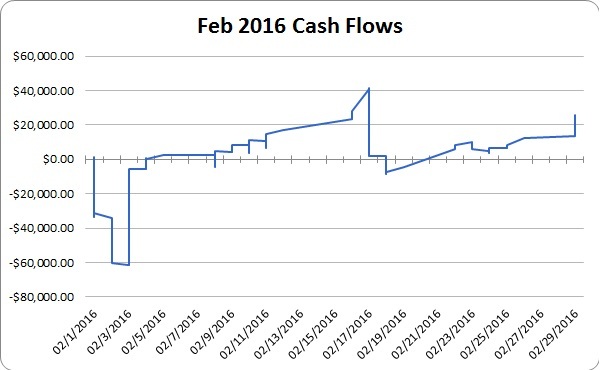 Here is a monthly cash flow example. If you know you will have big expenses coming up for taxes, employee bonuses or a big marketing campaign then you need to make sure you plan for them so that you are not scrambling at the last minute. In this example a company is not planning well for their quarterly employee taxes and dip below $0 in November. This entry was posted in Forecasting. Bookmark the permalink. ← Ignite Denver – Get an Extra 30 Minutes in your Day!